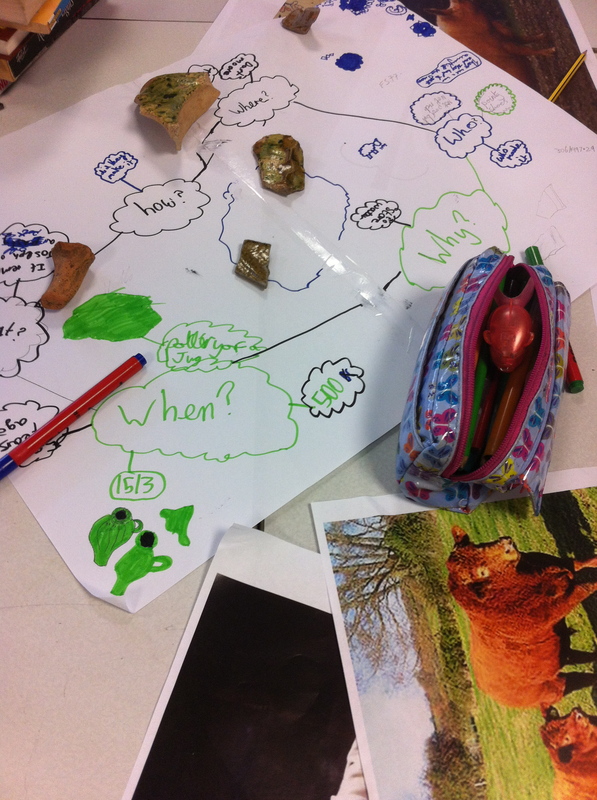 On 14 March 2013 we held a workshop in St Leonard’s Church of England Primary School in Exeter. We were invited by Ms Ruth Milankovic, Mr Sam Jones and Ms Wendy Daurge to work with two Year 5 classes (Year 5 RM and Year 5 SJ). 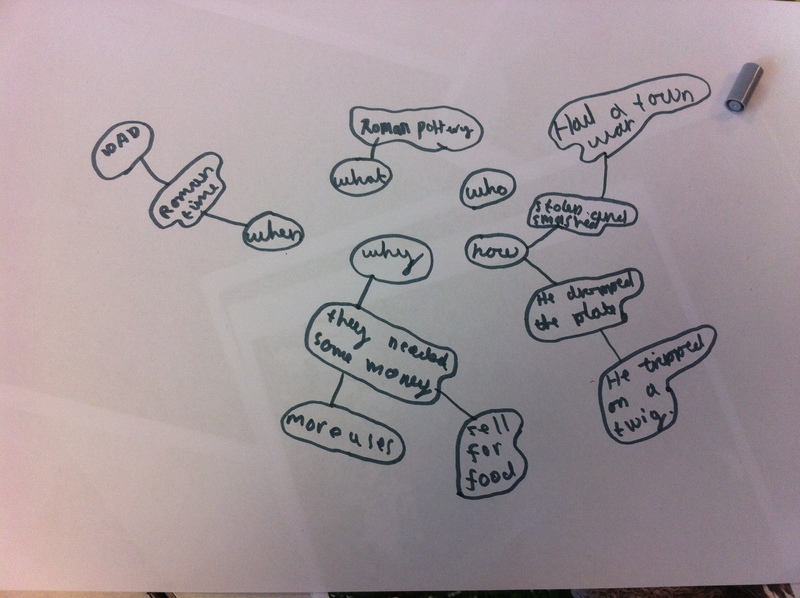 This workshop was part of the early research and development for Moor Stories, providing us with feedback which, as was the case with St David’s Church of England Primary School, is likely to impact on the development and design of the Moor Stories app. This time the workshop took place between two classes, though the children were all brought together at the beginning of the workshop into Mr Jones’ class to listen to Tom Cadbury’s introduction to the objects we brought from RAMM. Helen Burbage subsequently introduced the Moor Stories website. 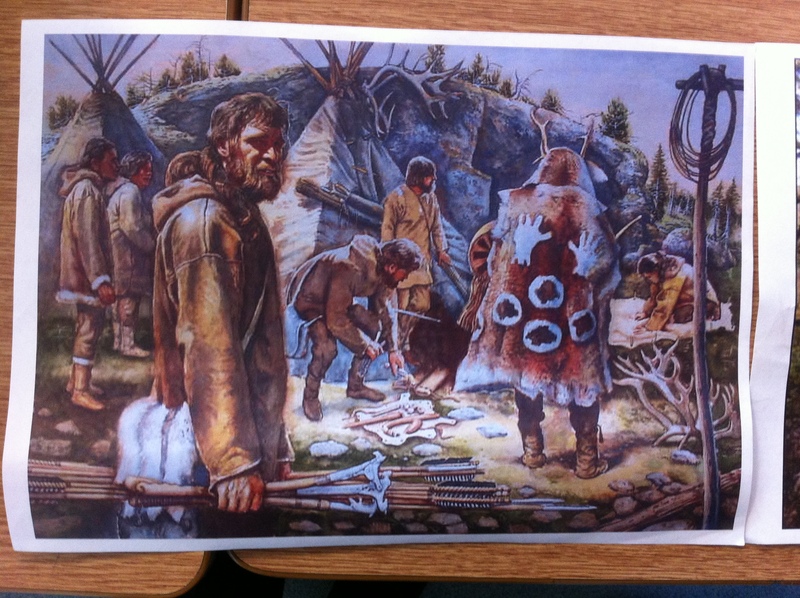 As in the previous workshop, we positioned a number of objects on each table, Bronze Age flints and arrowheads, as well as Medieval pottery, together with some contemporary illustrations to give a sense of what Dartmoor may have looked like at the times these objects were used. The children really appreciated the tactile experience, and I think that this played an important factor in inspiring the children to write a story. The task for the children was to write a story about the object or to include the object into a story. 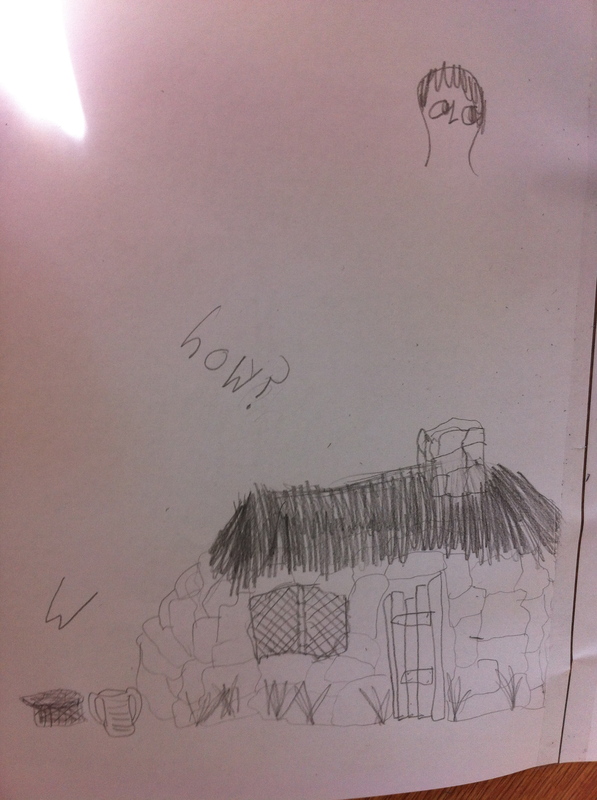 This was part of the school’s Just Write exercise, which gives the children regular extended writing opportunities. 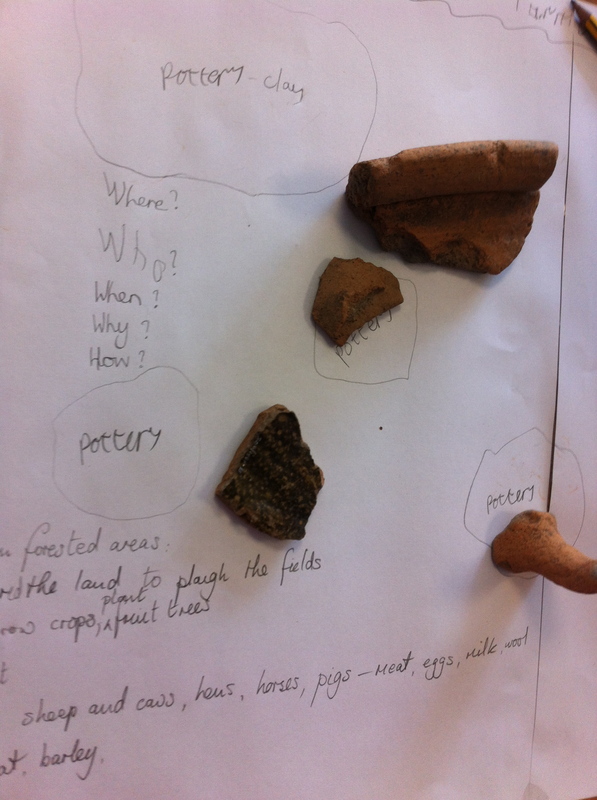 More specifically, the children were asked by Ms Daurge to play historical detectives and work out: ‘When, Where, Why, What and Who’ in relation to each object. 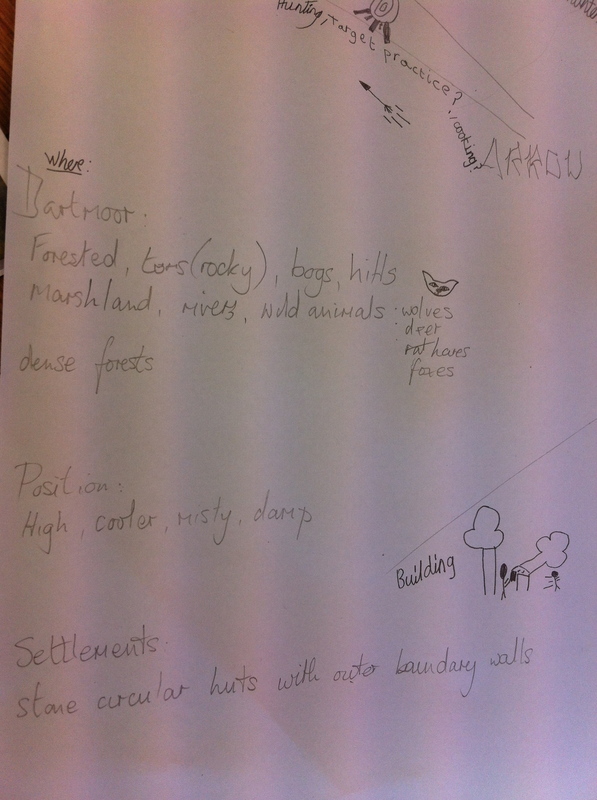 With these questions in mind, Ms Daurge noted, the children could analyse the objects, produce a map and then use the map to write a longer story at a subsequent point in time. This reminded me of my earlier blog in which I mentioned Michael Shanks’ comment on the similarities between the figures of the archaeologist and the detective, both piecing ‘together clues in order to reconstruct the past’ (1987: 7). Will and I agree now that the detective theme should run across the Moor Stories app. There were then subtle differences in the approaches taken by the two teachers. While Ms Daurge asked the children to imagine the person they were and think of how they were going to work with each object in their daily life, Mr Jones, in the other room, encouraged the children to think of a problem that their story could hinge on. In the end, all children had slightly different takes on their instructions, with Ted, for example, asking if he could write his Moor Story as a diary and Libby preferring to focus on identifying important details about the artefact itself, almost regardless of plot constrictions. As you can see (above and below) the maps look absolutely brilliant and we are all very much looking forward to reading the Moor Stories written for us by the children of St Leonard’s Primary School (I will do a new blog all about hem when I finally get to see them). 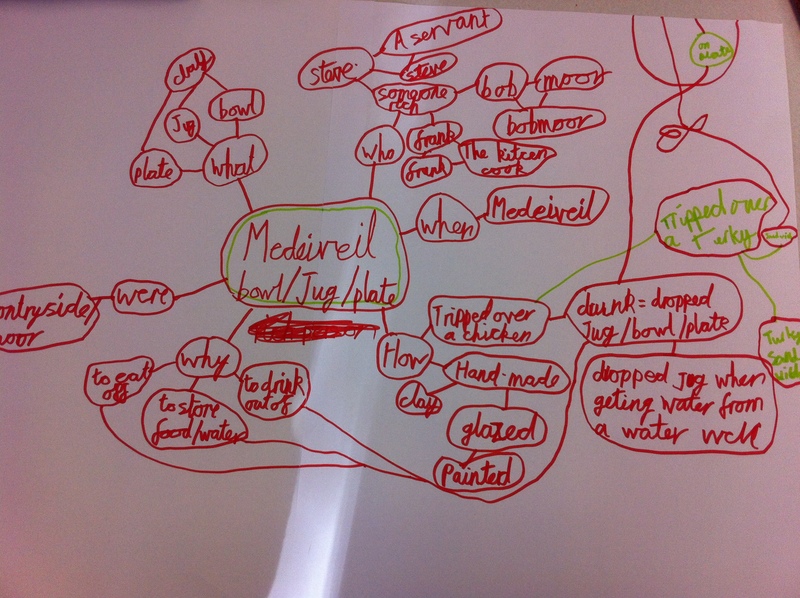 We learnt many things from the workshop and are hugely grateful to the very dedicated teachers and all the children. 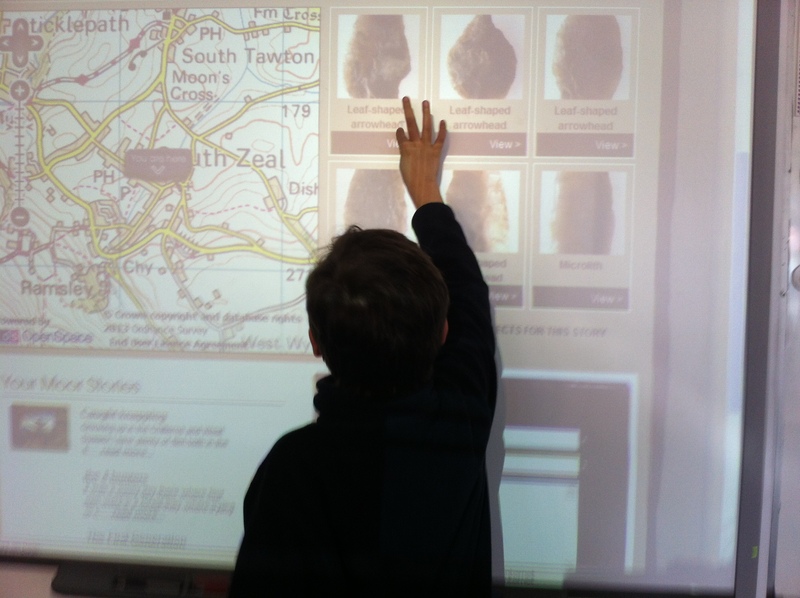 Observing the interaction with the website which was projected on their interactive white boards, we could see that Moor Stories could operate both as a learning tool and a creative writing tool. The teachers suggested the inclusion of video clips to describe the environment in which the objects were found and offer feedback about the historical period in which the objects were used. Shanks, M. (1987) Social Theory and Archaeology, Polity Press: Cambridge. On Friday 28 September it was an early meeting at RAMM to gather kit and objects and then off to Bristol. A punctual train meant we set up our Moor Stories stand in record time. Other exhibitors interrupted their own set up to admire the prehistoric flint tools and medieval roof bosses we had brought along. It was good to meet colleagues from REACT and partner organisations, as well as lots of new people. The films showcasing the six funded projects were all interesting and worth watching. These are now online on the new REACT website. Thanks to Matt and Jo and everyone at the REACT Hub for a great day and inviting us! Well, we met the project deadline and had the website in place for 1 August! We are pleased to see that people are using the website and got some very positive feedback from colleagues in the Dartmoor National Park Authority earlier this week. Do try the website, add your story and have a go at Church Detective! At the end of last month the project team went off to Mortenhampstead to meet representatives from community groups on Dartmoor. The event was at Green Hill Arts in Mortenhampstead, just by the church appropriately enough! It was a good venue and we felt very welcome. Thomas Cadbury and Penny Hammond, RAMM’s Curator of Antiquities and Community engagement Officer respectively, started the day with introductions and the background to the project. The connecting museum collections to locations and communities provoked much interest. Unfortunately the next part of the day did not go as planned. When Rick Lawrence, RAMM’s Digital Media Officer, went to present the website we hit a problem. No Internet access due to a fault on the BT line! We tried the wifi but it didn’t reach the meeting room. Staff at Green Hill Arts tried to help but to no avail. Using a mobile and Internet via 3G didn’t work either. It certainly gave us an insight into the challenge of mobile data on Dartmoor! We used some development graphics to walk our guests through the website and despite being slightly out of date all was fairly clear! Andy Chapman, from 1010 Media, gave an overview of the Church Detective game next. A full discussion followed and we felt by the end of the day we had all made some mutually useful new contacts.